Many people overlook their bathrooms when it comes to making their homes more energy efficient. In fact, many of the energy efficient improvements for the bathroom are easy to do yourself without having to hire a professional contractor or plumber. 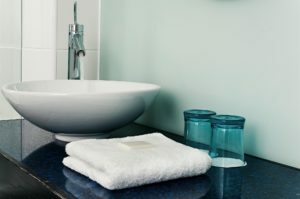 Below are several inexpensive ways to reduce your energy consumption in the bathroom and put some money back into your pocket, while doing something good for the environment. Install a low flow shower head. Not only will you use less water, but reduce the costs associated with heating the hot water for your shower. Fix any dripping faucets. Leaky faucets waste water, and increase your water and energy bills. Over 5 gallons of water can drip away right down the drain each day, which translates to almost 160 gallons of water a month. Install low flow sink faucets. These faucets only use 1.5 gallons of water per minute, which is a 30% reduction in flow compared to faucets that don’t conserve water. Shut water off when not in use. While you are brushing your teeth or lathering up the shampoo in your hair, shut off the water to reduce water consumption. Replace toilets with water efficient models. Today’s toilets only use 1.6 gallons of water per flush, compared to the 6 gallons used by older toilets. Install a dual flush button on the toilet. Dual flush buttons help conserve even more water, by giving you the option to do a partial flush or complete flush. Install a tankless water heater. There are all sorts of different models and options to choose from. A tankless water heater eliminates the need for a traditional water heater, takes up less space, and can even produce hot water using hydropower and solar power. Use bathroom fans and vents correctly. Fans and vents are great for drawing humidity and moisture out of the bathroom to prevent mold and mildew problems, but they should only be used for short periods of time; otherwise you are wasting energy. In most cases, you only need to run the fan for about five to ten minutes, or leave a vent open for about fifteen minutes. cleaning time is drastically reduced, so you save both time and money. By taking the time to make your bathroom more energy efficient, you will notice lower water and energy bills. In many cases, these types of bathroom improvements often pay for themselves in a year or less. Do not forget that you are also reducing your carbon footprint and protecting the environment. For more information about shower and bathtub enclosures, shower pans, ADA compliant tubs and showers, and other accessories, please feel free to contact American Bath Enterprises, Inc. today, at 888-228-4925, and speak to a representative.